Welcome to the February 2019 Live Your Dream Scrapbook Collection Blog Hop + Giveaway! This is your starting point in the blog hop and what a HOP it is. Altenew is thrilled to release its third collection: Live Your Dream Scrapbook Collection. I love this collection so much! Zinia did a wonderful job designing it and I have a soft spot for all the floral elements as well as the colors. It is so bright and cheerful – perfect for spring, which is just around the bend. It is jam-packed! So what did I create with this scrumptious collection? I made two layouts, one which I will share here and the other on my blog. I really wanted to create a layout with LOTS of butterflies and also show off all the colors in the collection. Cut out a bunch of butterflies. I used a cut file created by Paige Evans, who is also joining our hop. Place them over the layout in a scattered manner. Add patterned paper strips on the top edge. Pop a photo in the bottom right-hand corner. For the finishing touch, I splattered some Lilac and Mountain Mist Ink Sprays over the layout. Congratulations, Sandra! Please email us at winner@altenew.com with the subject line “Live Your Dream Scrapbook Collection Giveaway Winner“ by 03/10/2019 so we can set you up with your prize. To celebrate this release, Altenew is giving away a $50 gift certificate to 6 lucky winners! Please leave a comment on the Altenew Card Blog and/or Altenew Scrapbook Blog by 2/28/2019 for a chance to win. Six winners will be announced on the Altenew blogs on 3/3/2019. Don’t forget to visit the designers’ and guest designers’ blogs as there are many giveaways up for grabs. Thank you so much for joining the hop and happy crafting. 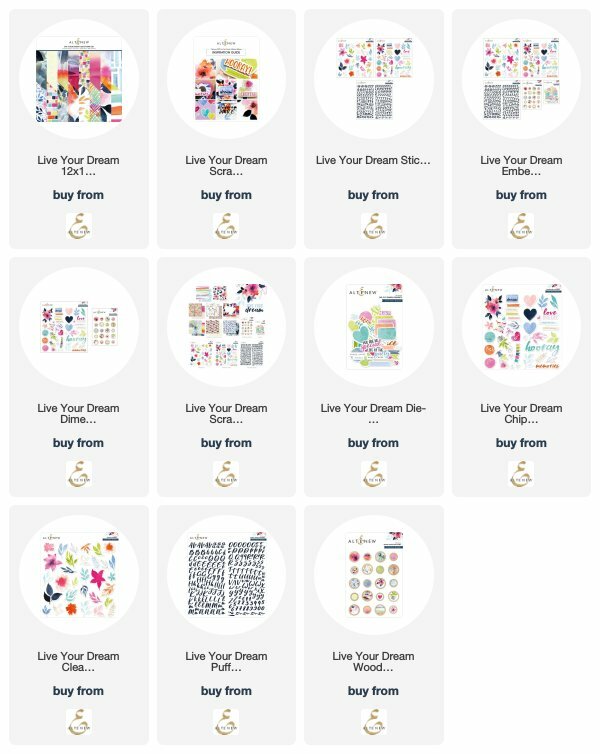 February 2019 Live Your Dream Scrapbook Collection Release Sneak Peek + Giveaway! This new collection is FABULOUS! Can’t wait to see it and play with it in person! Such a great new collection! Thanks for the video and what a great layout! Love all the butterflies. You show off the colors of the collection beautifully! Thanks for the inspiration! I love how great this collection looks! I can not wait to play with it. Wow! such gorgeous layout! Thanks for the inspiration. Can’t wait to have this collection! This new release is bright, Happy & beautiful! I’m living my dream by creating PaperArt and being amazed when it turns out beautiful! AlteNew releases make it easy! Beautiful colors with this collection. I love that you’ve coordinated everything in this release to work so wonderfully together. I’m looking forward to seeing all the creativity your team has to show us. Wow! What a gorgeous release! And great pages! Awesome release papers! Awesome creations, love the butterflies! I really like this collection but I wish that the papers came in 6×6 since I don’t have storage for the larger ones. I do like all the elements and ephemera and can see those working on so many cards. Thank you for sharing this fun layout! Just a beautiful collection! Love your layout ❤️. I’m so glad I’ve discovered Altenew! The words in this collection have such movement. “Dance” looks like it is dancing! Gorgeous colour palette and I really love the co-ordinating elements of the collection. I don’t scrapbook, but I will enjoy using this collection for cardmaking and multi-media projects. A very colorful release! I could create some very interesting projects with this. It’s a really great new collection. Wonderful! Love the butterflies — so clever you have inspired me!